In the 1850s AD, cotton-growing was getting more and more important. And white people in the southern part of the United States were getting more and more angry with rich people who lived in the North. One reason was that these northern rich people were getting richer from new factories they were building. But the southern rich people were not. Southerners were growing the cotton, but Northerners were spinning and weaving the cotton into cloth. Poor people were coming from all over Europe to work in the northern factories, spinning and weaving. 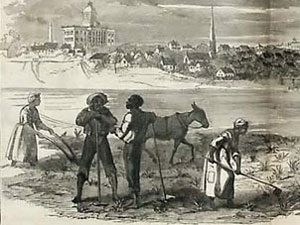 But in the South rich land-owners still forced African-American people to work as slaves in their big cotton and tobacco fields. People in the North wanted to make the southern land-owners free these people. They knew that slavery was unfair. The African-Americans wanted to be free too! Why did the South fight? But the Southern land-owners were afraid that ending slavery would just make the South even poorer. And the North would still be rich. That seemed unfair to them. Why did poor white Southerners fight? Poor white people in the South also didn’t like the idea that Northerners would tell them what to do. And poor white people didn’t like the idea that black people would be the same as them. 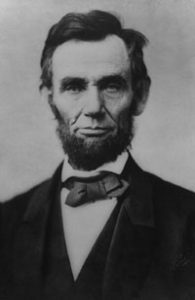 In 1860, the men who could vote elected Abraham Lincoln to be president. (But no women, or people who had recently arrived in the United States, or Native Americans, or enslaved African-Americans were allowed to vote). Lincoln was a northerner, and he saw things in a Northern way. His election made the southern people so angry and afraid that they decided to split off from the United States. They formed their own country, which they called the Confederacy. Which states joined the Confederacy? The states of Virginia, North and South Carolina, Georgia, Florida, Alabama, Mississippi, Louisiana, Texas, Arkansas, and Tennessee were in the Confederacy. Parts of Missouri and Kentucky joined too. Mostly these were the states where it was legal to own slaves. But there were four states (Delaware, Kentucky, Maryland, and Missouri) where slavery was legal that decided not to join the Confederacy. Cite this page: Carr, K.E. United States Civil War – American History. Quatr.us Study Guides, August 12, 2017. Web. April 23, 2019.